Rs 93,847.64 crore is the new education budget for 2019, 10 percent rise from last year. The Interim Budget 2019 announced an increase of 10 percent in the education budget, with a total amount of A total of Rs 93,847.64 crore allotted. Research projects initiated by the government last year contribute to the enhanced part, and there are no major changes in the funding for central universities. 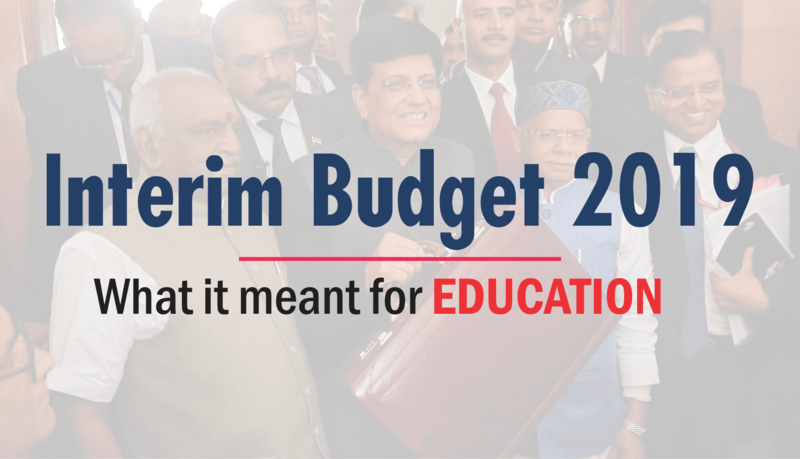 The Budget 2019-20 presented by Union Minister Piyush Goyal allocated a sum total of Rs 93,847.64 crore for both school and higher education combined, to be spent by the Ministry of Human Resource Development. Rs 37,461.01 crore has been allotted to higher educational institution and Rs 56, 386.63 crore has been allotted to school education. The budget allocated Rs 56,386 crore for the Department of School Education and Literacy, up from last year's Rs 50,000 crore, which was later revised to Rs 50,113.75 crore. The Department of Higher Education -- also under the Ministry -- was allocated Rs 37,461.01 crore, up from last year's Rs 35,010.29, later revised to Rs 33,512.11 crore. Through the Higher Education Funding Agency funding mechanism, the government has made available more than Rs 17,000. The government recently announced a 10 percent reservation for the economically weaker section (EWS) quota in the higher educational institutions which resulted into an increase of 25 per cent seats in the central universities. However the budget of these institutions didn't see any major changes from the previous year. The budget assigned for the central universities last year was Rs 6,445.23 crore which was later increased to Rs 6,498.55 crore. This year the funding for the same is Rs 6604.46 crore, which adds up to a rise of mere Rs 105 crore. The funding for existing Indian Institutes of Technology (IITs) saw an increase. It was up from Rs 5,613.00 crore to Rs 6,484 crore this year. The UGC has been allotted another Rs 4900 crore. The government has allocated Rs 11,000 crore against last year's Rs 10,500 crore (revised and reduced later) for the Mid Day Meal scheme. For research programmes like IMPRESS, Rs 130 crore has been allotted, marking an increase of 37 per cent. The budgetary allocation for the Rashtriya Uchchatar Shiksha Abhiyan (RUSA) has also been increased from Rs 1,400 crore to Rs 2,100 crore. The Unnat Bharat Abhiyan, under which 10,000 villages have been adopted by the higher education institutions, has got 70 per cent increase in budgetary allocation, the HRD ministry said to PTI.